Sometimes I look at my favourite brown and beige ingredients and want nothing more (think pasta, bread, rice, and beans). Then there are the days, when my body is screaming for as much colour as is plant possible. Today is a brown and beige day. Just kidding! A rainbow of colours, is what my body was craving, and a rainbow of colours you shall get. A reward for being such a mighty fine body- a body that moves me all the way to Starbucks while my brain is still sleeping. Now that’s a body that deserves this salad. 1. It’s super yum. A sesame orange Asian inspired dressing, lightly enhances the abundance of carrots, peppers, red and green cabbage, and edamame in all their vegetable glory. 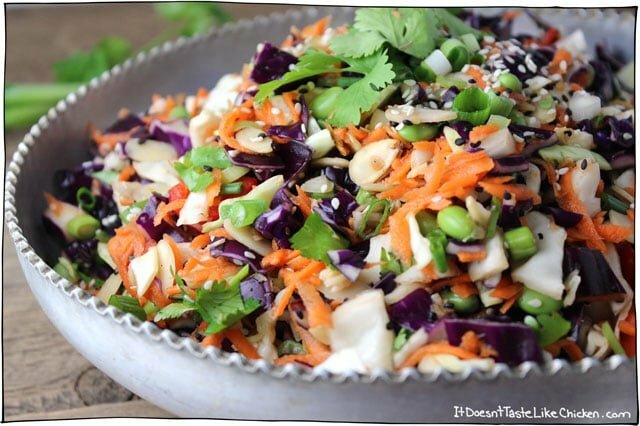 Topped with slices of almonds, sesame seeds, cilantro, and green onion, a taste paradise. 2. It’s super easy to make. Just chop to your hearts content. It doesn’t even really matter if everything is chopped evenly… like that large piece of cabbage right front and center in the photograph that is now annoying me and making me wish I had noticed it before taking the photos. Go away big piece of cabbage! 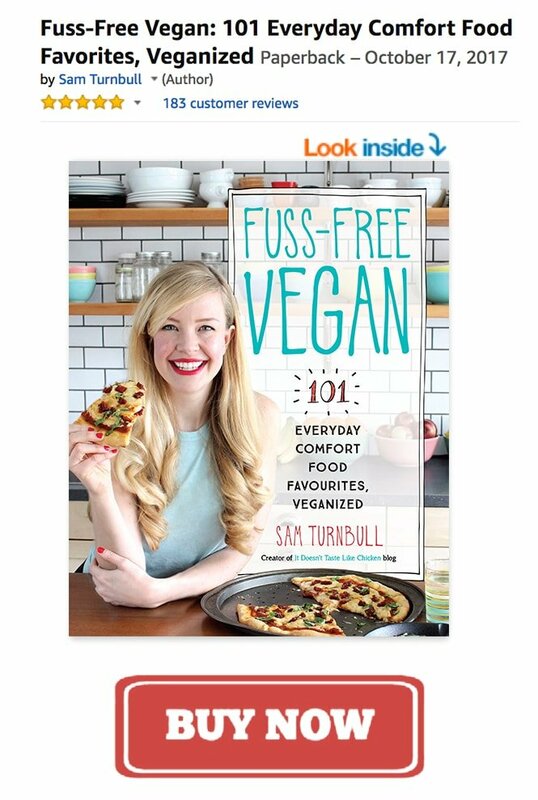 Ok, so maybe just eat the ugly pieces first. 3. It stores super well. Leftover wilted, dead, waste of greens- no more! This salad actually holds up pretty well as leftovers, and often tastes even better the next day! This makes it perfect for bringing to parties, or potlucks because it will be totally happy just hanging out looking all beautiful, getting checked out by the ladies. 4. It’s super good for you! I mean that’s pretty obvious right? I am sure you have heard the expression eat colour, well here is a bowl of colour, so eat it. 5. It’s a super beautiful work of art! Who says so? I say so! I have a masters of fine art, so I can say stuff like that and people assume I know what I am talking about. Anything that pretty deserves artistic appreciation. Did you count the ways with me? That’s five super reasons to love this salad! As if you even needed to get past number 1. 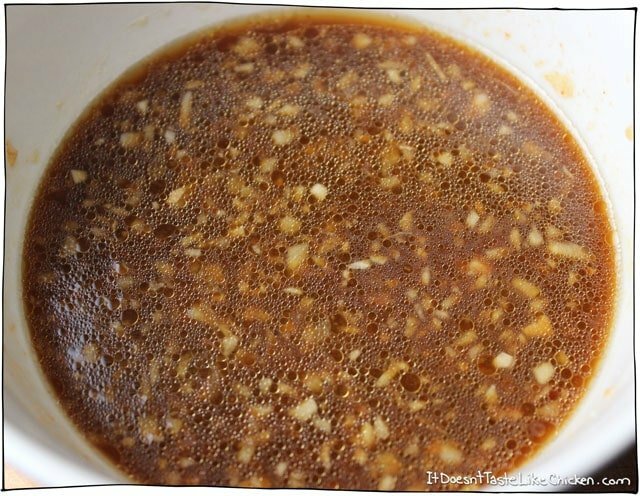 Make the dressing by mincing the garlic and ginger, and then mix them with the remainder of the dressing ingredients. Set aside to let those flavours build. I don’t like heavily dressed salads, so the dressing amount this recipe makes is just enough to lightly enhance the flavour of all of those marvellous veggies without being overpowering. If on the other hand, you prefer to taste dressing with a vegetable aftertaste, then I recommend doubling the dressing recipe. Dress at your own risk! Chop, grate, slice and sprinkle all that goodness into a big bowl. Then toss with the dressing. 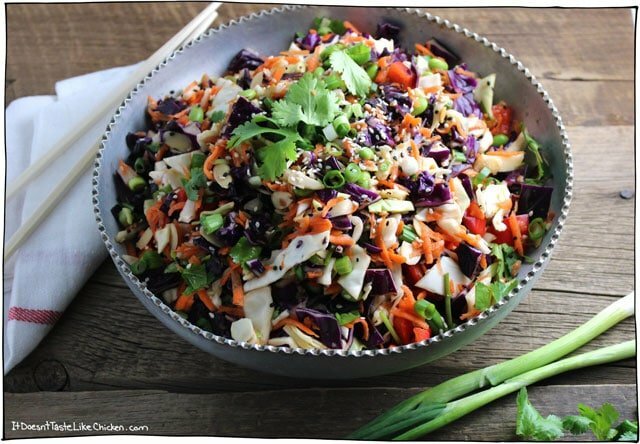 There you have it, an Asian Chopped Salad. Enjoy it right away, or let it sit for flavours to build even further. If you have leftovers just store them in an airtight container in the fridge for tomorrows lunch. 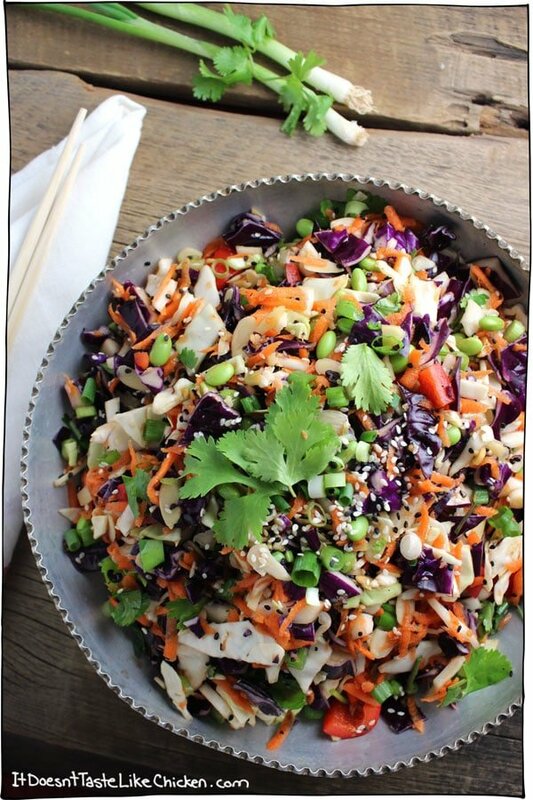 An orange sesame dressing, lightly enhances the abundance of carrots, peppers, red and green cabbage, and edamame in all their vegetable glory. Perfect for bringing to parties, or potlucks, as the flavours just get better as it sits. 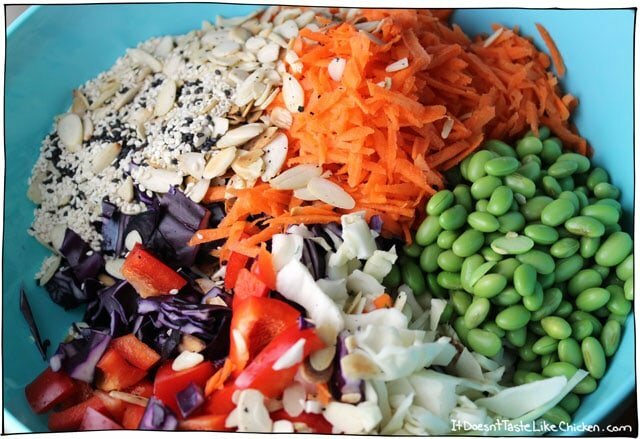 For the dressing: add all the remaining dressing ingredients to a small bowl and mix. Set aside so that the flavours can intensify. You can also make this dressing ahead of time and store in an air tight contained in the fridge. For the salad: in a large bowl, add all of the salad ingredients. Pour the dressing over top and toss well to combine. You can serve this right away, or you can let everything marinate and serve later. It will just get more flavourful as it soaks. This is a great recipe to bring to pot lucks as it just keeps getting better as it sits, and is even still good the next day! Featured Ingredient: Sesame. 86 days, 54 recipes to go! ok…this sounds amazing. I am going to make today to take to a sushi extravaganza new years eve party! thanks for the great idea…ill let ya know how it goes and add a rating! I never comment on recipes – but this salad is WOW, WOW, WOW. Absolutely delicious. The only changes I made was leaving out Cilantro (because I’m one of those people who dislike it) and added basil instead. I also added bean sprouts & sliced snow peas. The salad is a winner. Thank you. Yay! More salad! Must-eat-more-salad. Looks delish! Yes! Now that spring is here, I am craving more and more salads. Glad you are too Kathy! Thank you for including nutritional information. So many recipe blogs don’t and when I ask for it, I’m told it’s too time consuming to include or everything in it is healthy (yeah, but that doesn’t make it low fat or low calorie)…so thanks again. This looks yummy. You’re welcome Circket! I’m glad you find it helpful. I only started adding the nutritional info recently, so if you find one of my older recipes that doesn’t have the info, just leave a comment and I will happily update it. Oh, I agree, I hate when “healthy” food is covered in oil. If I am going to eat healthy, I want healthy. If I want to splurge on a Vanilla Cupcake, for example, then I am not worried about it. Yum! 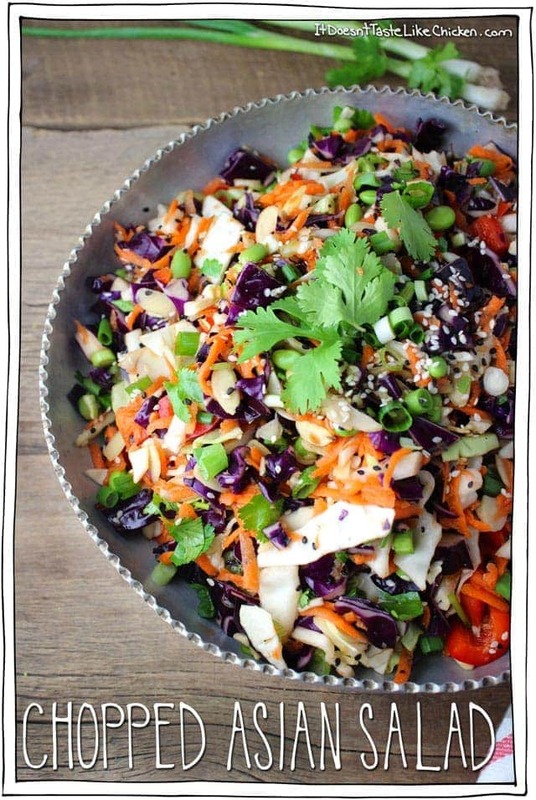 I love Asian inspired salads, this looks so crunchy and delicious. I especially love the sound of that dressing. Thank you Linda! I have been munching on this salad for days, it’s so yummy and crunchy indeed.